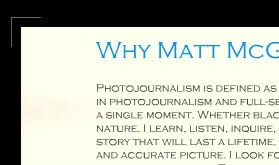 So since my last post I have really dove into jquery head first and found a copious amount of new plugins to use from cookies to carousels and I thought I would share a few with you we really used on MattMcgrawPhotography.com we are still tweaking the site but it is live in it's current form. and has a nice sliding animation to it. Next what we did was use a plugin from AListApart.com that does nice nav sprite transitions. the plugin offers two really nice transitions the glow that we used and also a sliding motion to swap between up and hover which isn't bad either. Now the tricky part was we needed to do some cookie/session editing to make it so if a user opens the gallery menu to have it stay open on page refreshes. Luckily we were able to find a jquery cookie plugin that made the process uncomplicated. so now if someone clicks on the gallery nav item it stores that they clicked it open and when the page refreshes from going to a different gallery or contact page after the page loads jquery checks to see if that cookie is stored and set to an open state if it is then jquery animates the nav item to open. and if they click the nav item again it stores that it is closed. So to wrap all of this up Jquery can do alot and if you don't feel like building your own plugins then don't there are ton out there and you can probably find one to fit your needs and tweak it from there.